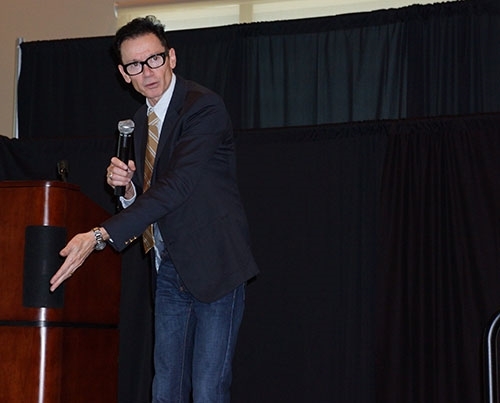 Jack Gantos speaks at the 2013 literacy conference presented by the College of Education and Health Professions. The University of Arkansas Clinic for Literacy is offering an afternoon with children's author Jack Gantos for teachers and teacher-education students. "Writing Radar with Jack Gantos" will take place from 1 to 3 p.m. Saturday, Sept. 8, at Room 166 of the Graduate Education Building. The event is free but online reservations are required. Teachers can earn two hours of professional development credit from the Arkansas Department of Education. Gantos has written books for readers of all ages, from picture books and middle-grade fiction, to novels for young adults and adults. His works include Hole in My Life, a memoir that won the Michael L. Printz and Robert F. Sibert honors; Joey Pigza Swallowed the Key, a National Book Award Finalist, Joey Pigza Loses Control, a Newbery Honor book, and Dead End in Norvelt, the 2012 Newbery Medal Winner and the Scott O'Dell Award Winner for Best Historic Fiction. Gantos will share ideas on now to inspire readers to build confidence and establish good writing habits as they create, revise and perfect their stories. With his signature wit and engaging presentation style, Gantos will focus on how to help young writers use their "writing radar" to unearth story ideas from their everyday lives. Gantos will also speak the morning of Sept. 8 at the first of four Saturday sessions of the fall literacy camp for children offered by the clinic for literacy. Online registration is also available for the children's literacy camp.